Richard McLane, Bisca’s founder and Design Director, is a time served blacksmith. He started Bisca in 1994 after graduating from Northumbria University with a first class honours degree in design. University tutors preferred students to specialise in a single medium. Richard, however, experimented combining glass, steel and timber into his designs. Pushing boundaries in design and media interfaces, proved to be a foundation for success. The name BISCA comes from the materials Richard used in the early days. Today, our designers have a much wider portfolio including bronze, stone, timber, glass etc. A chance encounter whilst exhibiting at 100% Design catapulted Richard into the staircase business. Impressed by his creativity and the quality of display items, a property developer asked Richard to if he could design him a staircase for his own home. Having no experience with staircases, Richard’s answer, of course, was yes! Further staircase commissions for the developer’s property portfolio followed. 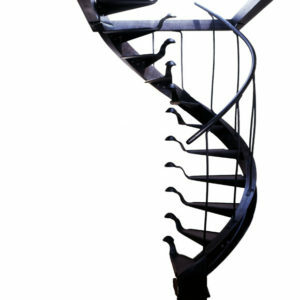 Two years later Bisca’s portfolio of unique staircase designs began to attract attention. Enquiries started to come in from those appreciating bespoke design and craftsmanship. Since then, Bisca has earned a fantastic reputation for designing beautiful bespoke staircases. Although we enjoy one off architectural commissions, our focus remains on staircase and balustrade design. Several of our early staircase designs have remained popular with editors. To this day they continue to be selected to appear in print and online alongside staircase and interiors features. Based in Helmsley on the edge of the North York Moors, Bisca are serious about social and environmental issues and work in partnership with a close local network of suppliers and skilled craftsmen.